Log Cabin, 3 bedrooms: king, queen, 2 twins, futon-loft, Baths: 1 full, 2 half. 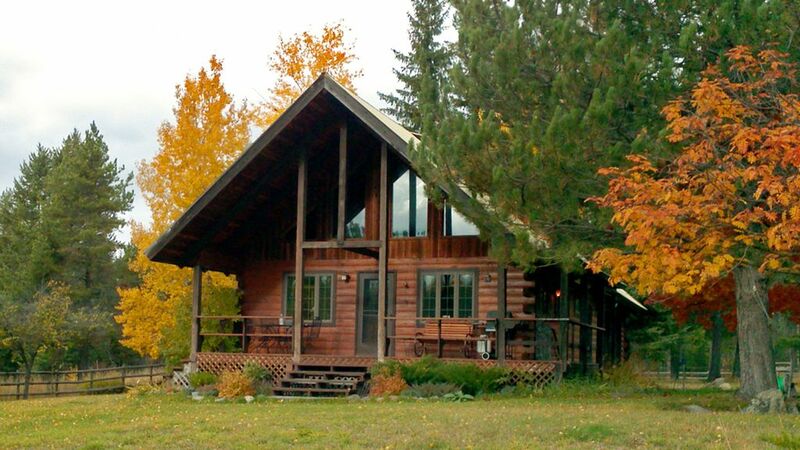 Our log cabin is conveniently located near Coram Montana on a well maintained county road just 8 miles from West Glacier, the west entrance to Glacier National Park. It sits on 8 park-like acres overlooking a 27 acre pond/wetland that is home to many birds and animals. The setting is peaceful, teeming with wildlife and yet located near many wondrous and fun attractions. Spring begins at the pond, with the emergence of the painted turtles. They have been hibernating and come out to sun themselves on the floating logs. Many birds visit and live at the pond. The most prevalent are grebes who build floating nests to hatch and raise their young. Ducks, loons and Canada geese are also residents. Blue herons are frequent summer visitors. Our last fall visitors before freeze-up were a family of 6 white swans. While the pond is a wonderful place for wildlife, it is not a place to swim or fish. The pond has an abundance of lily pads and fish as food for birds (too small for people). Enjoy our pond by watching the wildlife. We have enjoyed many hours restoring this 1970's structure and now hope you will enjoy our resulting efforts. The furnishings are an eclectic mixture on new and old, comfortable and interesting, with handmade quilts on each beds. When you are tired of hiking you will find puzzles, a read-it-or-trade-it library and over 200 movies to entertain yourself. If cooking is your 'thing' the kitchen is fully equipped. Our favorite cabin spot for reading or dining is the porch. With patience and quiet the deer or elk they may come to visit; they are always around but are shy. Please visit our Cabin Website by clicking the link below under 'Links to more information'. Our cabin website features a floor plan, lots more interior photos, and pages about the area including maps and our favorite day trips. There is a sink in each bathroom. The cabin is located on a 29 acre pond. About half the pond is covered with lily pads in the summer. Long distance service only with a calling card. The home has a natural gas furnace and electric heaters in the basement. Living room on main floor, living area and game table on loft and tv area in basement. There is salt/pepper and basic spices. There are lots of dishes, silverware and serving dishes. Kitchen is fully equipped with many small appliances and utensils. Kitchen table has 2 leaves. Seats 4-6. Table on porch seats 6 and there is a table in the yard which seats 4. There is also a gas grill on the porch. Television in basement receives 7 channels. Paperback read it/take it/trade it library. There is an air hockey table in the basement tv area. Many board games and puzzles. There are four steps to get to the main floor of the cabin from the garage or outside. Nice cabin. Convenient location to West Glacier. We enjoyed our stay at the property and the proximity to Glacier Park. You never know what you are going to get looking at the pictures but we were pleasantly surprised! The cabin was clean and well maintained. After reading all the wonderful reviews of this cabin I knew this was where I wanted to stay and I was not disappointed. My family of 5 recently vacationed here for 4 nights and we absolutely loved it! There was plenty of room for all of us to spread out and the cabin was stocked with everything we could possibly need and more. The location felt very private and secluded but was just minutes to the West Glacier entrance. I started every morning with a cup of coffee on the porch while taking in the breathtaking view. One morning I was even joined by a deer! The kids enjoyed the loft and our family game nights. We were able to explore many areas of the park from here including East Glacier and Many Glacier. Kathy was a pleasure to work with and quick to respond to our question. We would not hesitate to stay here again. Wonderful house close to West Glacier. Our family’s first trip to Glacier National Park. The property included everything we could have wanted. Very well maintained. Close to everything we wanted to do! Yet very peaceful after a day hiking and relaxing by campfire . Definitely recommended. Wonderful cabin with great location. Close to everything that you want to do on the west side of Glacier National Park, yet secluded enough to feel "out in the woods". Owner was great with regular communications and recommendations. Tidy cabin is setup with everything that we needed (even things we didn't know we needed like bear spray). So glad you had a good stay at the cabin. Hopefully you can return some day when Logan Pass has been plowed. I really enjoyed this property. It was very comfortable and the location was perfect for us. I strongly recommend this beautiful cabin. One thing I must note, though I hate to mention because it's not the owners fault, but there is a wood pecker that woke us up between 5:30 to 7am most mornings. He pecks the metal right above the master bedroom. It's VERY loud! If you're an early riser, this won't bother you at all and it's a must stay cabin. If however want to sleep in, it's something to consider. Our family of four had a great stay! We loved being close to Glacier and coming back to the cabin each evening. There were many great games to play, movies to watch, and the kitchen had everything we could possibly need! The deck looked out on the pond where we saw loons and swans. Thanks for a great stay!